I’m gearing up for my first international travel on work. Off to Santiago, Chile, a country in South America, at a distance of 17000kms from Chennai. (Little less than half of earth’s perimeter) Just a short 1 week assignment and will be back in time for an important wedding. Technically this is my second international trip, but practically first. The earlier 2 day trip to Srilanka was technically international, but practically too short, simple and India-like to feel international. 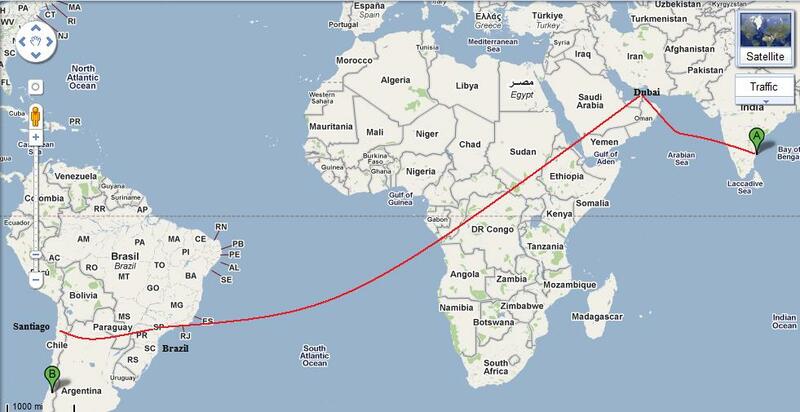 Have to undergo 30 hours of marathon flight transiting via Dubai and Brazil to reach other part of Planet Earth. (I’ve only few hours of transit time here-wish I had a longer transit time- preferably couple of weeks each at Dubai and Brazil J). I’m told Chile is a beautiful place, let me see. I’m not going there for leisure. Work related responsibilities will keep me busy for most of the time. Will do whatever little exploration I can, when time permits. This also means there may not be much blog posts for next couple of weeks. Bon Voyage man! Have a great trip. Let me know if you need any local connects...I know a couple of street photographers there. Thanks Mohan, Sankara and Supreetha for your wishes. ತುಂಬಾ ಕಾತುರದಿಂದ ಕಾಯುತ್ತಿದ್ದೇನೆ ನಿಮ್ಮ ಚಿಲಿ ಬರವಣಿಗೆಗಳಿಗೆ!!! ದಕ್ಷಿಣ ಅಮೇರಿಕಾ ನನಗೆ ಎಂದೆಂದೂ ಕೌತುಕದ ಖಂಡ. ಅಮೆಜಾನ್,ಏಂಜಲ್ ಫಾಲ್ಸ್,ಆಂಡಿಸ್,ಟಿಟಿಕಾಕ,ಕ್ವಿಟೋ,ಲಾಪಾಜ್,ಈಗ್ವಾನಾ ಫಾಲ್ಸ್,ರೈಯೋ-ಒಂದೇ ಎರಡೇ??? Whatever little I can manage in between I"ll do. all the best :) have a nice trip! Excellent blog ... Got here through Indiblogger ... Nice concept and good to see that you are able to use the blog to pursue your interests. hope everything gonna be fine.Have a save journey.